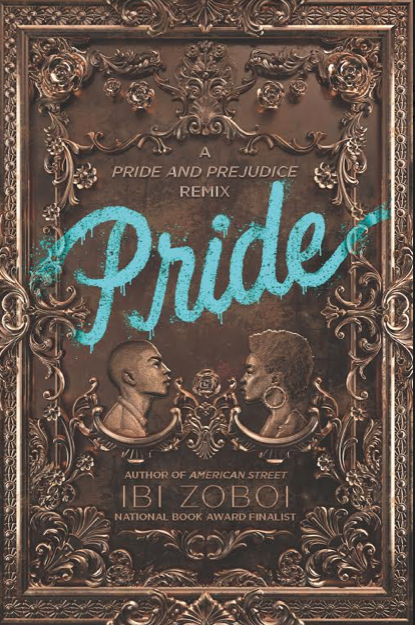 Today we're excited to chat with Ibi Zobi, author of Pride. Read on for more about Ibi and her book, plus a giveaway! Ibi Zoboi was born in Port-au-Prince, Haiti and immigrated to the U.S. when she was four years old. She holds an MFA in Writing for Children & Young Adults from Vermont College of Fine Arts, where she was a recipient of the Norma Fox Mazer Award. Her award-winning and Pushcart-nominated writing has been published in Haiti Noir, the Caribbean Writer, The New York Times Book Review, the Horn Book Magazine, and The Rumpus, among others. She lives in Brooklyn with her husband and three children. American Street is her first novel. I really wanted to write a love story after American Street, but I also like to include some political themes in my stories. It was challenge finding a way to balance a summer romance with everything that was going on in the world. Pride and Prejudice provided the perfect structure for me to examine socioeconomic class and gentrification in a love story. My favorite character in PRIDE is, by far, Zuri Benitez. She is tough, opinionated, smart, and she loves her family and community. The best thing about her is that she's quick to realize when she's wrong. The title came first, as soon as I decided that it was going to be a Pride and Prejudice retelling. I love the banter between Zuri and Darius. It's a battle of wits and they are challenging each other to see their point of view. 5. What do you like most about the cover of the book? I absolutely love that there is a black couple on the book cover, something I rarely see in YA. The design of the whole book is absolutely gorgeous, and I'm so grateful for all the work that went into it. 7. What new release book are you looking most forward to? Dream Country by Shannon Gibney. 8. What’s up next for you? I edited the anthology, Black Enough: Stories of Being Young & Black in America. It features 17 Black authors, including myself, and their coming-of-age stories of Black kids navigating the world and simply being who they are. 9. Which character gave you the most trouble when writing your latest book? Darius was the hardest to write. I didn't like him either. It was challenge for me to make him likable in Zuri's eyes. 10. Which part of the writing process do you enjoy more: Drafting or revising? 11. Is there an organization or cause that is close to your heart? I value any global organization that aims to provide a free education to marginalized girls, one of which is Girl Rising. One winner will receive a copy of Pride (US only). The cover design is uniquely appealing, and the synopsis convinces me this is a worthwhile read! I LOVE re-tellings of classics! Can't wait to read this one. The cover is interesting. I hope YA readers will find it catchy. It will be interesting to read the retelling of this classic. I absolutely love this cover. I was lucky enough to read this early and it's so good! The cover is eye-catching. The synopsis is very interesting. I always check out a Pride and Prejudice retelling and this one sounds like a great read. I love the classic look to the cover. This sounds like a great re-telling. The cover is amazing. The synopsis sounds emotional and exciting.